Ultimate Frisbee and Disc golf greats Brodie Smith, Avery Jenkins and Simon Lizotte show us how to have fun with our favorite toy the disc golf disc or for some of you the Frisbee. This video brought a smile to my face, I especially liked the “wall ride” trick shot off the fence into the basket–BOOM!! What was your favorite shot? Now it is time for some of us females to start working on our trick shots and battle these masters; take notes ladies! Opening my own business has always been a dream of mine, and I have considered myself an entrepreneur my whole life, from kool-aid stands in the front yard to re-selling my clothes, I have always been trying to help others purchase the goods they needed. Maybe that is why in my adolescent and early adult life I had no clue what I wanted to do, because what I wanted to do took me learning who I was and finding a hobby that encompasses my life. 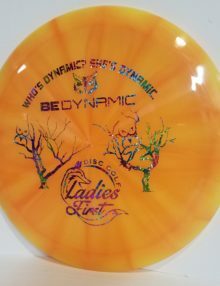 Now that I have found that hobby and know myself a little better it all makes sense and that is how, when and why Ladies First Disc Golf was born. This past Spring some changes at my work caused me to lose my company provided health insurance and the future was uncertain, but at least I had a job. I was actively looking for employment but nothing was appealing to me, I wasn’t willing to sacrifice my freedom and happiness for maybe more money and benefits, but less time and joy. I decided to take a different path than the safe and secure corporate world, and decided I was going to start my own business. I still work at my current employer because I like what I do, but Ladies First is hopefully something I can do full time in the future. 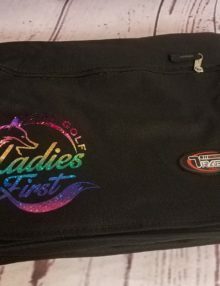 I am full of ideas, they just come to me when I started thinking about the fact that there was not a one stop shop for the female disc golfer to get discs, apparel and accessories I realized there needed to be, because disc golf is growing, and female participation is also growing. That is where Ladies First came to be not just an idea, but now something that was really going to happen, and did! 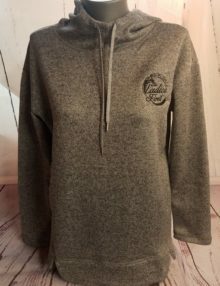 If you know me or have met me, you know that I like helping people, I just can’t help myself but help, which makes all the things Ladies First will do and accomplish great, we are helping ladies and gentlemen find the discs and disc golf apparel they need.